Long-sought water for Wilderness Village comes nearer everyday as men and heavy equipment dig through the earth and bury the pipe which will connect to the Seattle Water Department pipeline northeast of the Village. 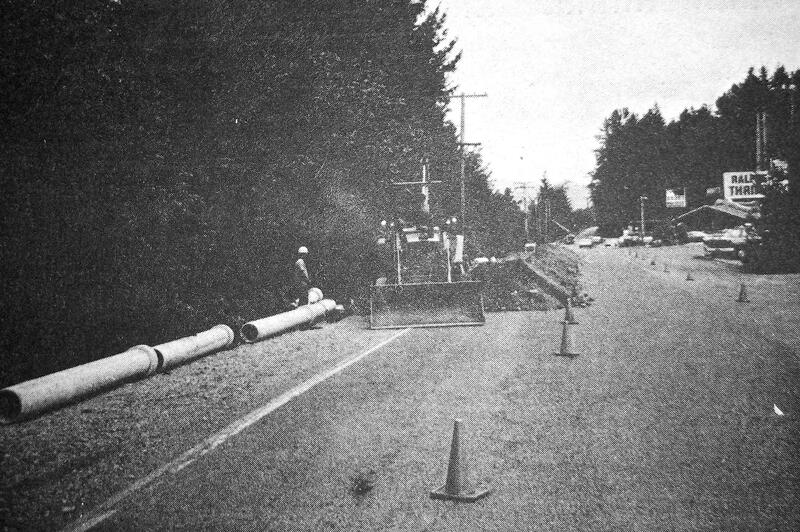 The ditch shown above will lead pipe under the Maple Valley Highway. Any last doubts about Wilderness Village Shopping Center receiving its long-sought public water were dispelled last week as men and equipment moved in to begin the job. Only one hole in the ground was visible as of last Thursday on the east side of Highway 169 at the Witte Road intersection. That’s near the planned beginning of the tap-in to the City of Seattle Pipeline. The actual connection will be made at the gravel pit, according to Bob Sloboden, manager of Water District 108. Drilling is now in progress under lie highway, Sloboden added. Before long the pipe, now stacked at various locations around the shopping center, will be placed in the ground, beginning on Witte Road behind the Sea-First Bank. The pipe will proceed to the library only. The proposed professional center near the library is not receiving water at this time, Sloboden said. Basically, a 12-inch pipe will be used on Witte Road and underneath Highway 169, and an 8-inch pipe will extend across the Wilderness Village parking lot, which will have to be broken up in the process. About 11 fire hydrants are planned, spaced 300 feet apart on Village property. Cost for the initial phase of the project will be between $140,000 and $150,000, Sloboden pointed out. “All of the costs haven’t come in yet,” he said. This amount will be paid by the district with the shopping center obligated to repay it through connection charges or other means. In addition to the pipeline itself, a pump station will be built, to be finished in November or December at a cost of about $160,000 to be paid by the shopping center alone. “The pumping station will bring the pressure and fireflows up to county standards,” Sloboden said. 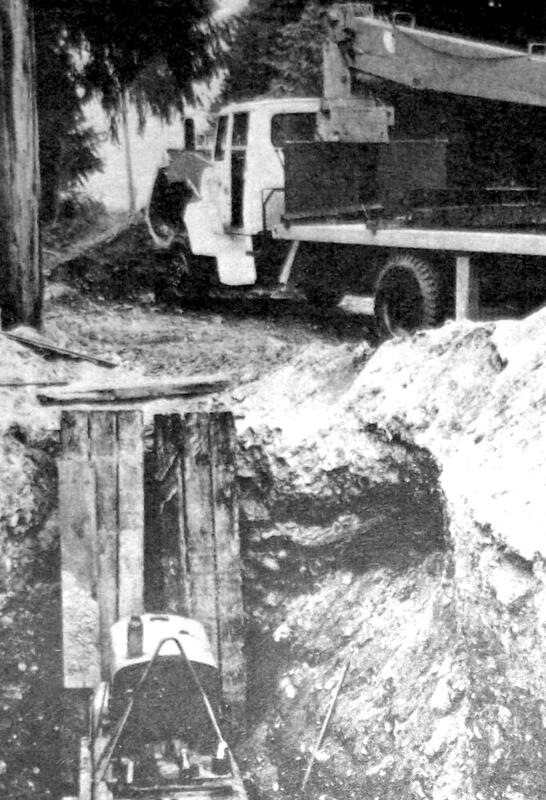 End of long struggle—Joe Flynn’s seven-year effort to obtain public water for Wilderness Village began to “pay off” last week as crews began laying pipe along Witte Road. Como Contractors, Inc. is doing the pipeline work and Bishop Construction will be the contractors for the pumping station, according to Sloboden.